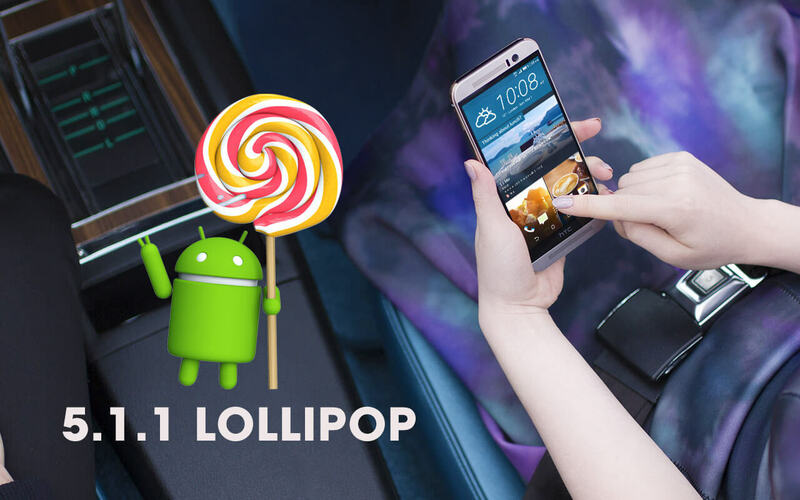 Now, the Official Android 5.1.1 Lollipop update is rolling-out Over-the-air (OTA) to HTC One M9 users worldwide. The update packs the hugely acclaimed Stagefright exploit patch. The OTA package is about 900MB in size and brings lots of bug fixes, security enhancements and performance improvements to the flagship which is expected to receive the Marshmallow update by Early 2016. 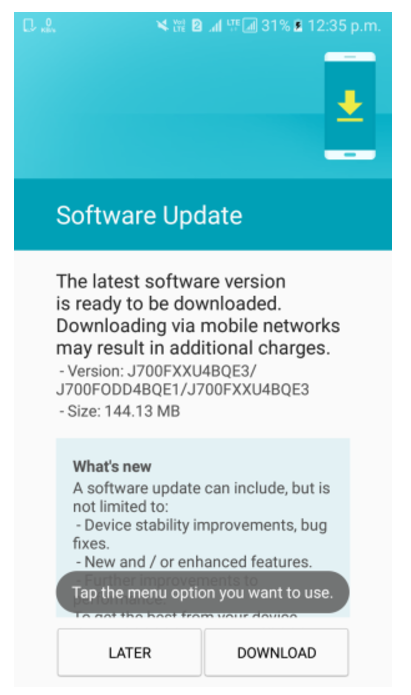 The Galaxy J7 Prime had started to receive the security patch for the month of February just yesterday and today, the same update is rolling out to the J5 Prime. 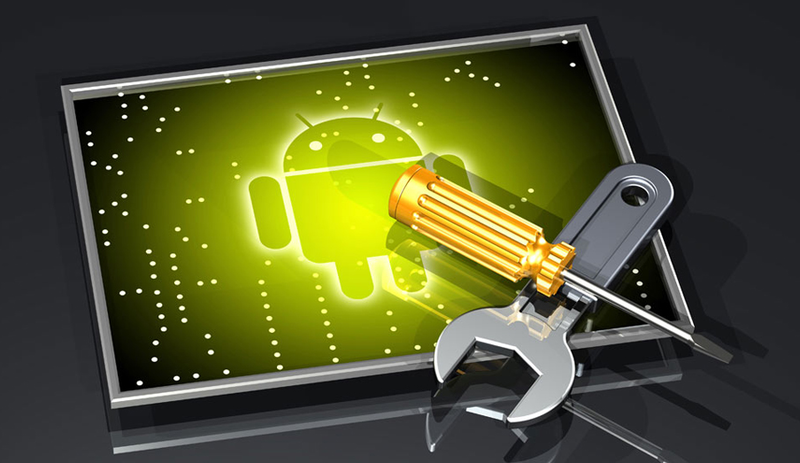 Both updates feature no major changes or improvements apart from filling in the security gaps in the base Android build. The updates will bring build version G610FDDU1AQA2 for the Galaxy J7 Prime and G570MUBU1AQA3 for the Galaxy J5 Prime. Both packages will land on your devices via OTA within the next few days. 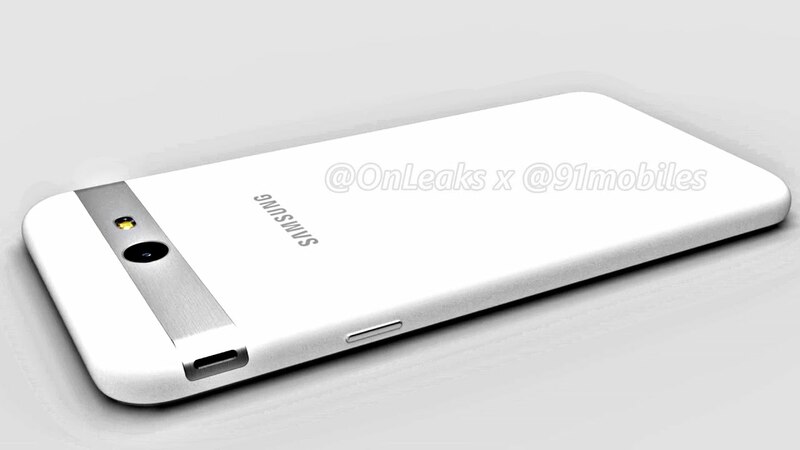 In other news, the next iterations of these two devices, aka the Galaxy J5 (2017) and the Galaxy J7 (2017) are speculated to be released this March with mid-range specs. If you are interested in the specs of the J7 (2017), check it out here. The J5 (2017) will also have similar specs as the J7 (2017), except for a weaker SD 617 chip and a smaller 5.2-inch 720p display. If you have a Samsung smartphone that you want to update with the latest firmware versions, head over to our firmware section to find all the latest updates for your smartphone. If you own any one of the two Samsung flagship smartphones, you should receive a notification for another new update very soon. This one will upgrade the firmware to version FXXU1APE9. 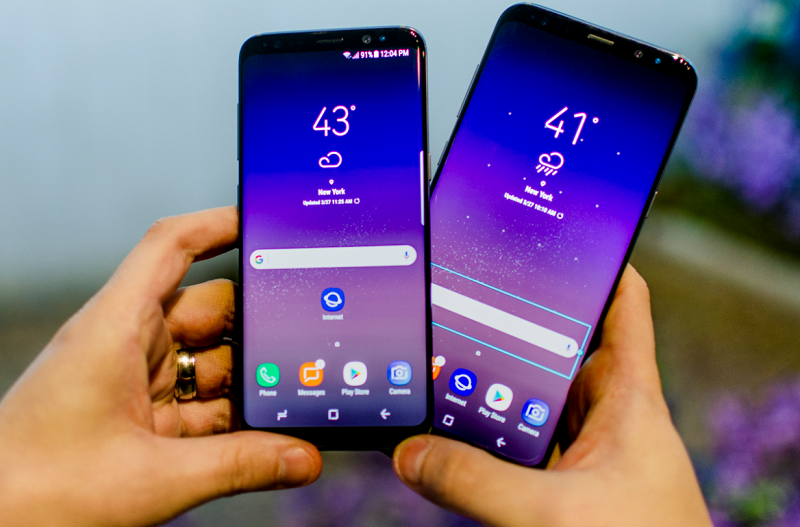 The Korean OEM wasn't particularly famous for releasing fast and rapid updates, but this year, things have changed for the good. Multiple updates have been rolled out since the two phones were released in March, addressing bugs and improving stability in the process. This one fixes a complex issue in which the power saving mode was disabled as soon as Google Now was launched. It will also resolve the initial flickering that some users complained about while playing back recorded footage. Users will be able to save files to the SD card without any problem now and according to Samsung, "icon location cycle has been changed to improve screen clarity" on the Always On display. The update is a midsized 332MB file for the S7, and a 353MB one for the S7 Edge. 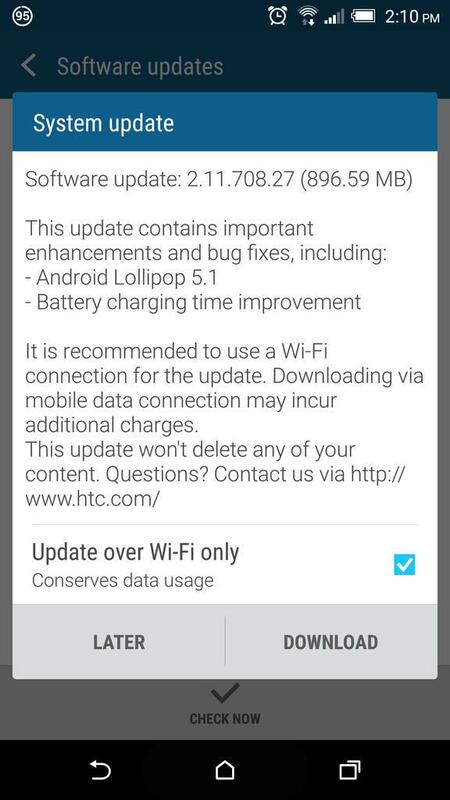 It is an OTA update as usual and we recommend the use of Wi-Fi for downloading them. Although you should receive an automatic notification, you can always check from Settings >About device >Check for updates to see if the patch has arrived on your device yet. 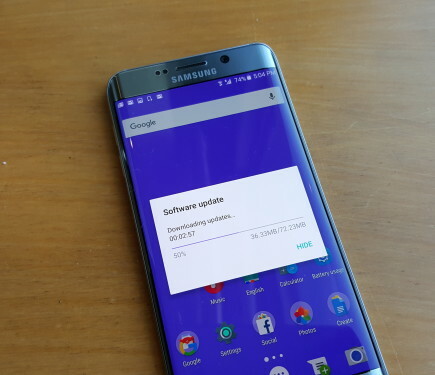 European versions of the Galaxy S6 Edge + smartphones are now receiving the October SMR patch, right on the heels of the S7 and S7 Edge. 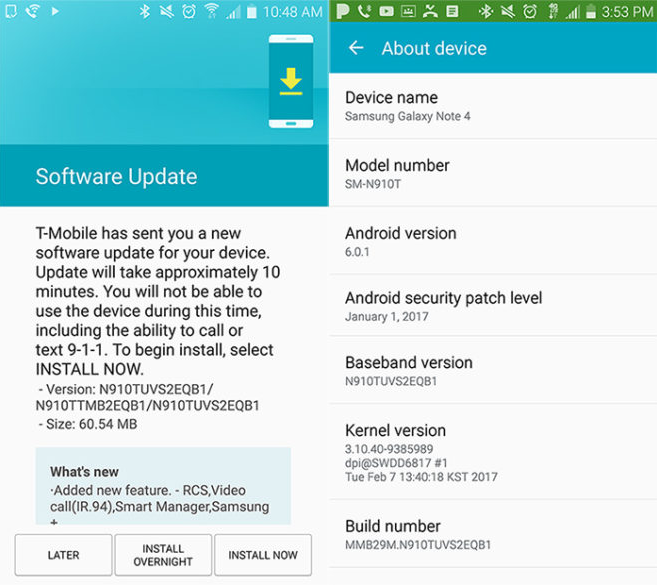 The update will address seven issues exclusive to the Samsung smartphones and about 68 vulnerabilities/bugs shared by all Android devices running on Marshmallow 6.0.1 (post the September SMR installation). Feel free to check for the update from Settings > About phone > Software updates manually, but even if you don't, you should be prompted to upgrade your device when it becomes available to your phone. Connect to Wi-Fi in order to finish the download and installation process according to your own convenience. Once the update is downloaded and installed properly, your phone's Build Number should change to MMB29K.G928FXXU3BPJ3. Unfortunately, the regular S6 and the S6 Edge is yet to receive the October patch and we are not quite sure when it will be made available for them. Nevertheless, it should be going live any day now. Few days ago, Microsoft released a patch for a critical remote code execution vulnerability, CVE-2015-1635 (MS15-034). Now, it has been spotted being exploited in the wild by researchers at the SANS Institute. 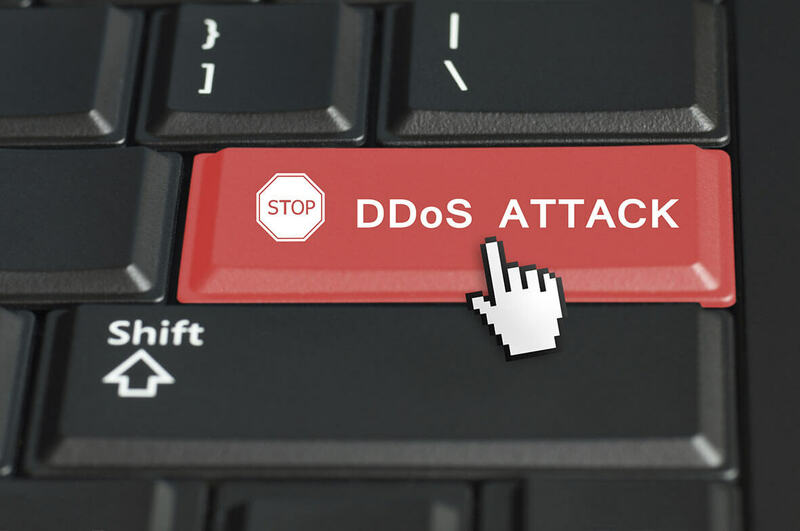 "Denial of Service (DoS) exploits are widely available to exploit CVE-2015-1635, a vulnerability in HTTP.sys, affecting Internet Information Server (IIS)," noted Johannes Ullrich, Chief Technology Officer of the SANS Internet Storm Center. The vulnerability affects Windows 7, Windows Server 2008 R2, Windows 8, Windows Server 2012, Windows 8.1, and Windows Server 2012 R2. According to UK research firm Netcraft, over 70 million websites hosted on around 900,000 servers could be vulnerable. "Due to the ease with which this vulnerability can be exploited, we recommend that you expedite patching this vulnerability" - Ullrich said. The February security patch has been reaching Samsung handsets pretty fast and the company has shipped them out to even some of the ancient ones, like the Galaxy S4 on T-Mobile. 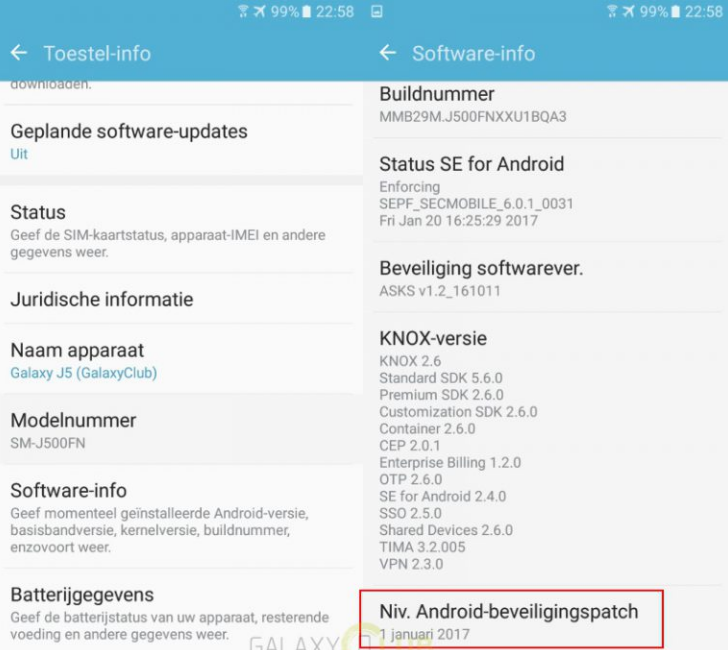 The Galaxy A8 and the Galaxy J5 (2016) has just started to receive the monthly patch as well. 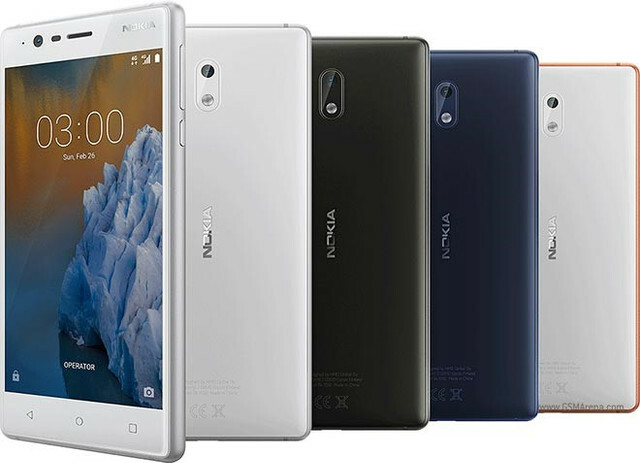 The firmware version released this month for the A8 and the J5 (2016) is A810FXXU1AQA2 and J510MNUBU2AQA5 respectively. The J5 Prime and the J7 Prime had already received the update a few days ago. As always, feel free to cheek from Settings > About device > System updates for the OTA file, if you haven't received a notification yet. In the meanwhile, if you have a smartphone that had received its last official update ages ago, check out our firmware section for all firmware versions released for Samsung smartphones. You will find custom ROMs and official updates over there, but before you try to flash anything onto your phone manually, just go through our tutorial on how to use Odin3. 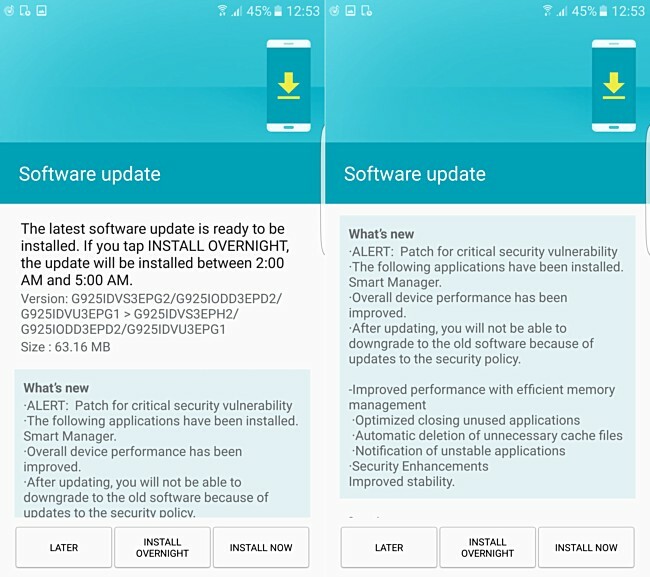 Samsung continues to support the Galaxy Note 4 with regular security updates as the February patch begins to hit the unlocked Galaxy Note 4 in Europe. Considering that even some of the its newer devices have not yet received the February patch from Samsung, it is a bit surprising. 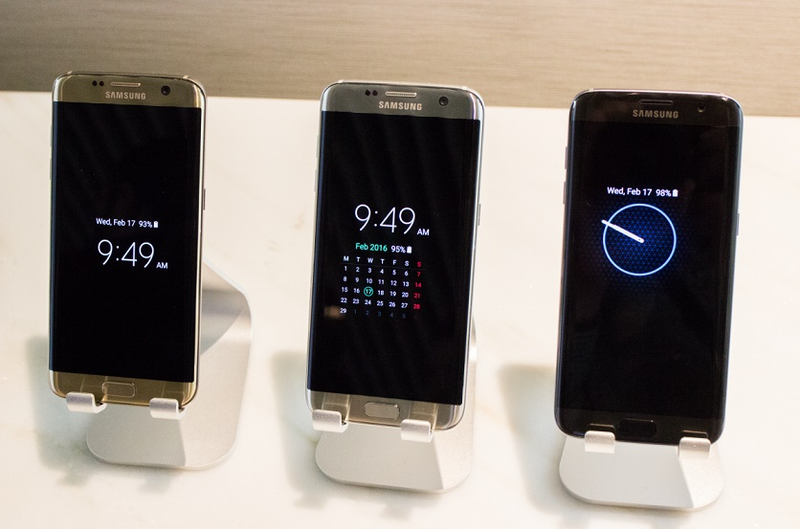 Nevertheless, it's good to see Samsung still supporting its older flagships. 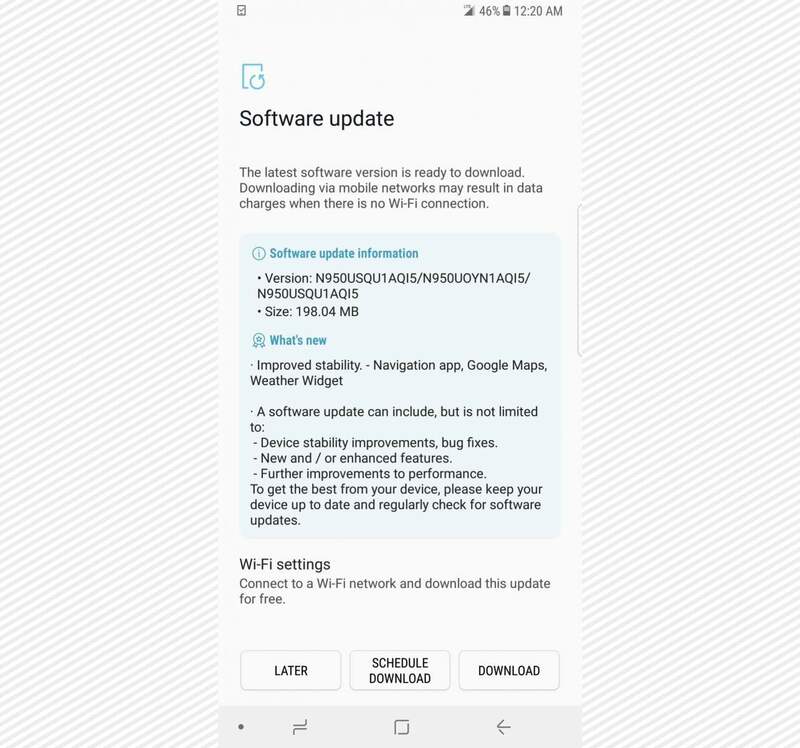 The firmware version for this update is N910FXXS1DQB4 and it brings all the fixes included in the February SMR release along with a few of Samsung's own custom bug fixes and performance improvements. Although people keep saying that the Galaxy Note 4 is now too old to receive any updates from the OEM, Samsung keeps rolling them out and that's a good thing. Nevertheless, an official Nougat update is certainly not coming to the Note 4 or any of its contemporary handsets. If you are in Europe, the update should hit your device within the next few weeks. If you are in any other region, you may have to wait a while before getting it. 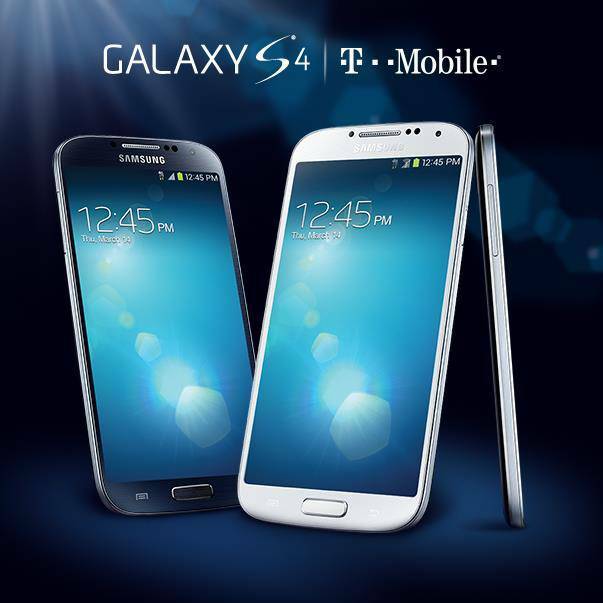 You can also head over to our firmware section to find all the latest available updates for your Samsung smartphones. As expected, the Galaxy Tab S2 is now receiving the Nougat update form Samsung in certain regions. The OTA update is hitting both the 9.7-inch version and the 8-inch version, but not in the same areas. According to reports, the 8-nch Galaxy Tab S2 with the model number SM-T715 is receiving Nougat in Italy, while in Germany, the 9.7 inch variant with model number SM-T810 is getting the same upgrade. However, it's only a matter of days before all devuces in the regions start receiving the upgrade to the latest and greatest Android OS. The good news is that the 954.93MB file also contains the latest April security patch, making this a truly useful and complete update for the two tablets. Apart from the usual bells and whistles that are associated with each and every Nougat update, the Tab S2 will not feature a completely new user interface, that is better, faster and more secure, thanks to the April SMR. You may have to wait a while if you are not in any of these two countries, but now that it has staretd to roll out, you can rest assure that wait won't be too long. 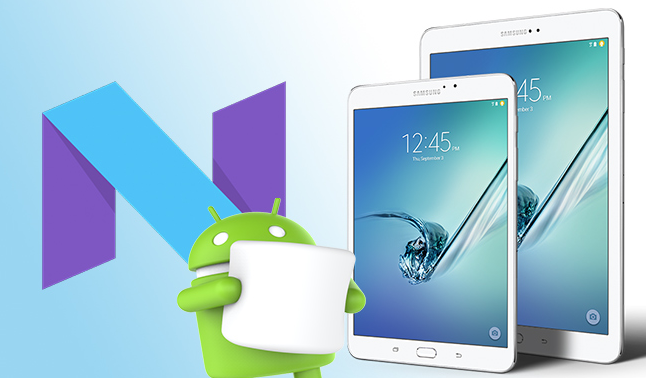 In the meanwhile, if you want to try out the Nougat update for the Galaxy Tab S2 before its official release in your region, head over to our firmware section. 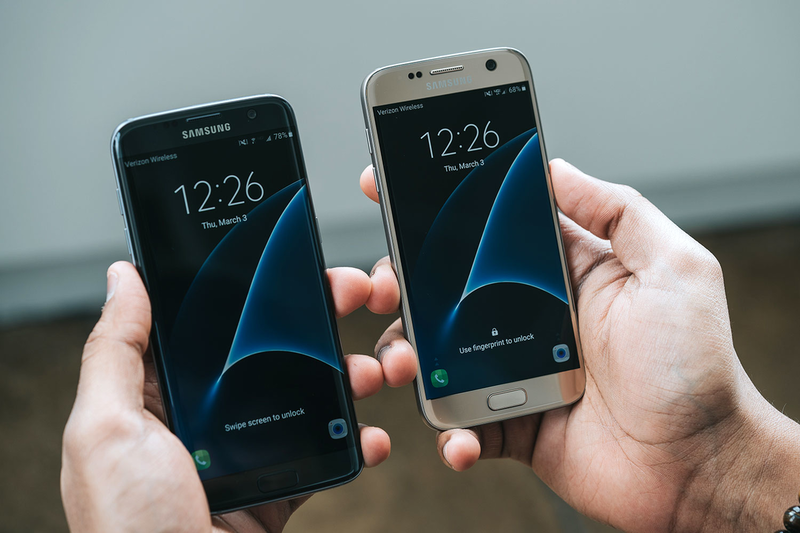 Finally, as we almost near the end of the month, the April security patch for the Galaxy S7 and S7 Edge have finally arrived for Verizon users. The software version is NRD90M.G930VVRU4BQC5 and along with the Android Security Maintenance Release for the month, it also adds a few custom changes from the carrier and the manufacturer as well. 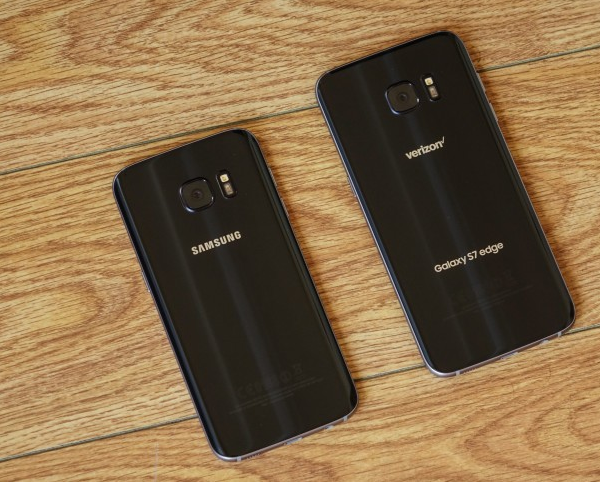 Users of the Galaxy S7 and S7 Edge on Verizon will now be able to use Verizon's One Talk feature, which had been missing from the two handsets up until now. In case you are not aware what the One Talk feature is exactly; it basically allows a user to connect his/her mobile and office device to one registered Verizon number. You will also find Knox Mobile Security as an option on your device after the update. Reportedly, it updates the Amazon shopping application on the two devices to v8.1.1 as well. The security patches from Google and Samsung for the month of April have finally arrived for the Galaxy S7, S7 Edge and the Note 5 in India. However, there's just one problem with this; we are already a week into May! Considering that these are all flagship smartphones from the company, the delay is disappointing and unexpected. 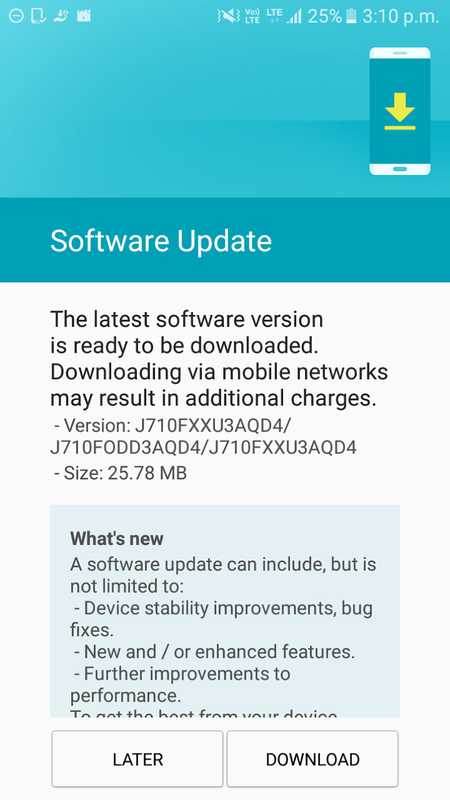 The update comes in at a hefty 169.79MB for the Galaxy S7 (G930FXXU1DQD7) and 176.49MB for the Galaxy S7 Edge (G935FXXU1DQD7). 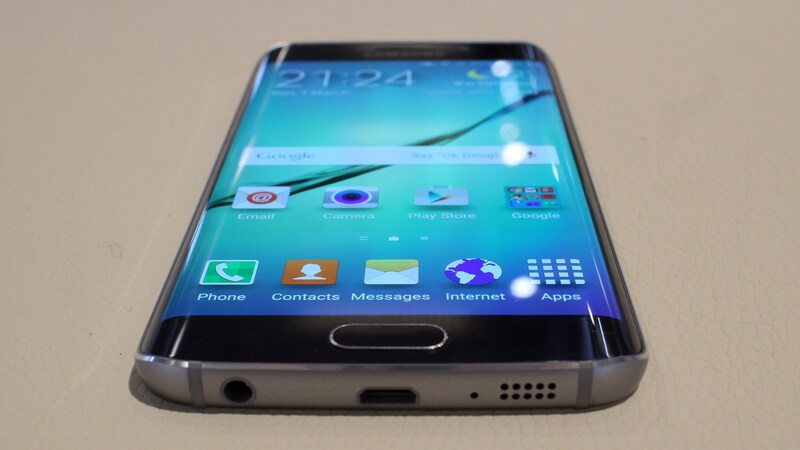 The size is a bit surprising, given that the same patch comes in at only about 14MB for the Galaxy Note 5. 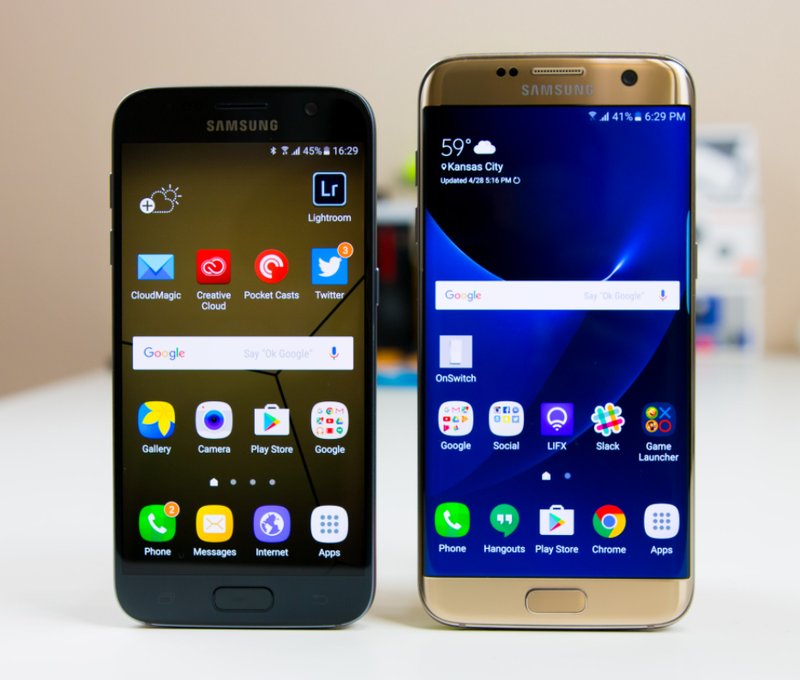 We are guessing the size difference is because the updates for the S7 and S7 Edge contains many more of Samsung's custom improvements than the one released for the Note 5. As I always say, it's better late than never! Check your smartphones now to see if it has arrived on your smartphone. Also, do check out our firmware section to see if you are missing out on any major firmware upgrades; official or unofficial. 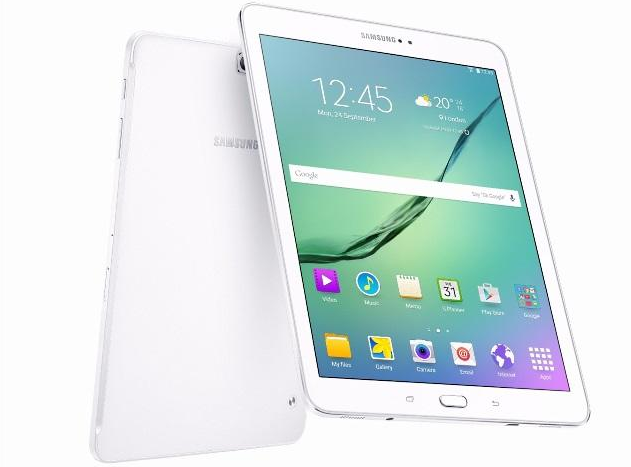 Although Android Nougat for the Galaxy Tab A was released just a few days ago, unfortunately, it was meant only for the Tab A 10.1 (2016) and not its smaller, older sibling. 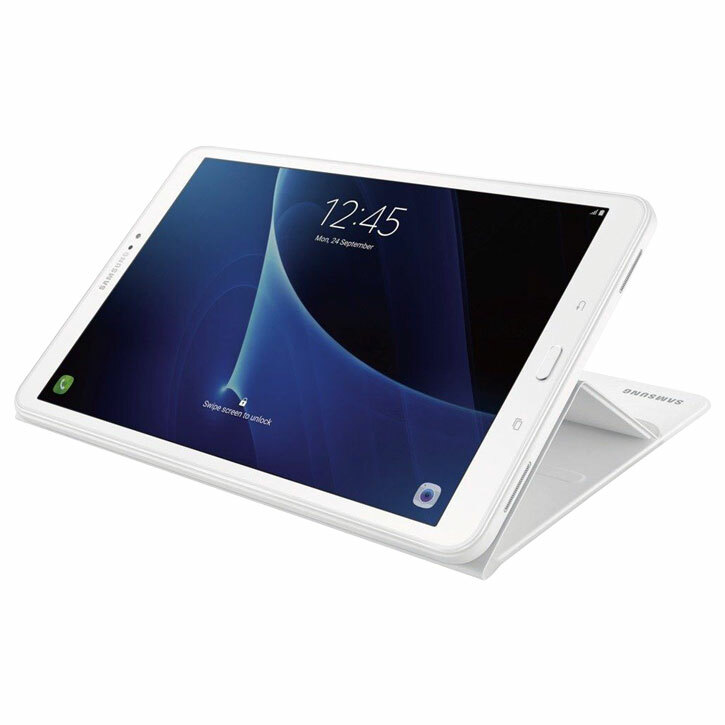 When reports about an update being rolling out for the older tablet began to circulate, many of us hoped against our better judgement that maybe Samsung is feeling particularly generous this year towards the Tab A line-up! However, that was not meant to be, because firmware version P350ZSU1BQD5 only contains the April security update, a few minor improvements and some bug fixes introduced by Samsung. The Wi-Fi + LTE version should also get it soon, but at this moment, just the Galaxy Tab A Wi-Fi only variant is receiving the update via OTA. In case you still own the aged Galaxy Core Prime released by Samsung back in 2014, you should be pleased to know that Samsung is currently rolling out the same April security update for both versions of the device as well. If you were hoping that Nougat is coming to the Core Prime, we suggest that you try a custom ROM! 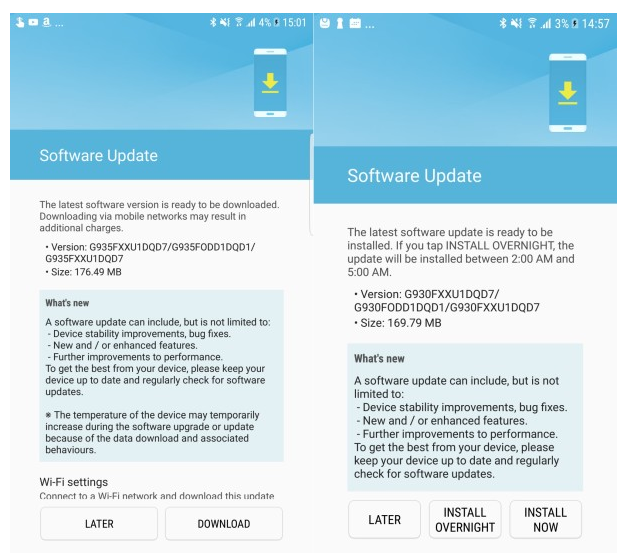 The latest flagship handsets and an old smartphone from 2015 just received the May security patch from Samsung in India and reportedly, these three are the first ones to receive the latest Android SMR in the country from the Korean company. 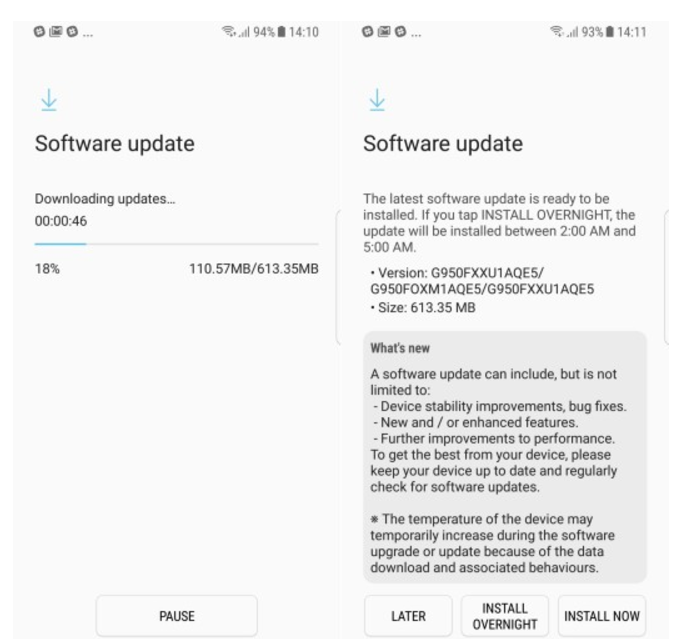 The OTA package (firmware version G950FXXU1AQE5) seems surprisingly light for a 613MB file, given the fact that Samsung doesn't mention much about the improvements it brings along with the May security update. Nevertheless, check out the screenshot above which details the info as seen. Firmware version J700FXXU4BQE3 with the May Security update also started landing on the Galaxy J7 Original (SM-J700F) at roughly the same time in India, but it comes in at a much smaller size of 144MB. Check out the screenshot just above the paragraph to see some of the details of the update. No details regarding the security patches were revealed so as to prevent cyber criminals and hackers from bypassing them. 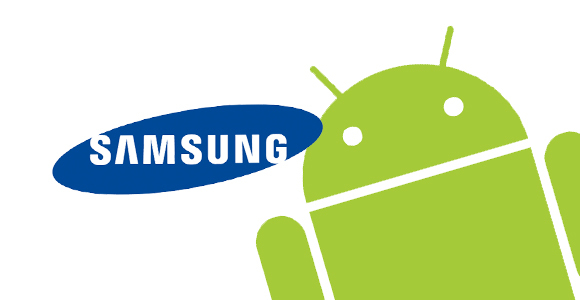 Nevertheless, it contains 54 Android CVE patches and 11 patches from Samsung's own arsenal. 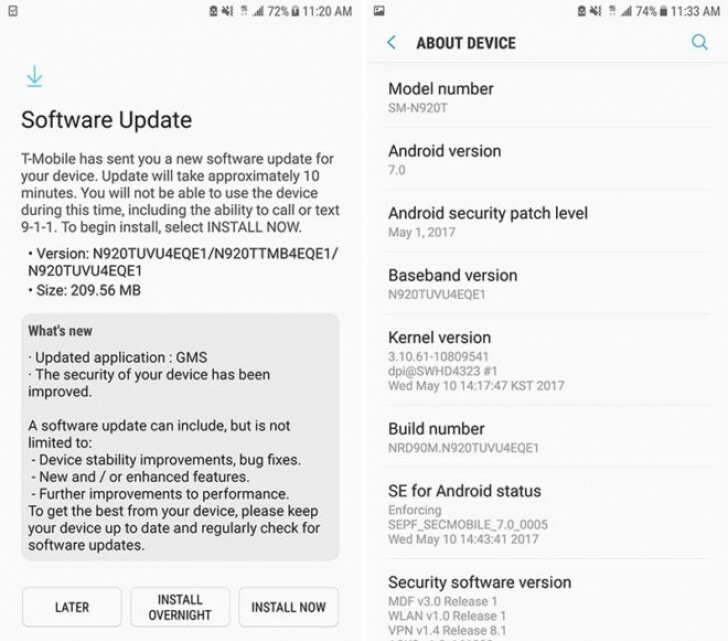 Although the Galaxy Note 5 on T-Mobile is running on the latest version of the Android Nougat OS upgrade offered by Samsung yet, strangely enough, it did not receive the April security update for some reason. However, that should no longer be an issue because T-Mobile has already started to roll out the May security Update for its users across the US. The firmware version of the update is N920TUVU4EQE1 and it comes in at a decent size of 209.56 MB. Even though it's not a particularly big file, use your Wi-Fi if you have it (you better get one soon if you don't!). 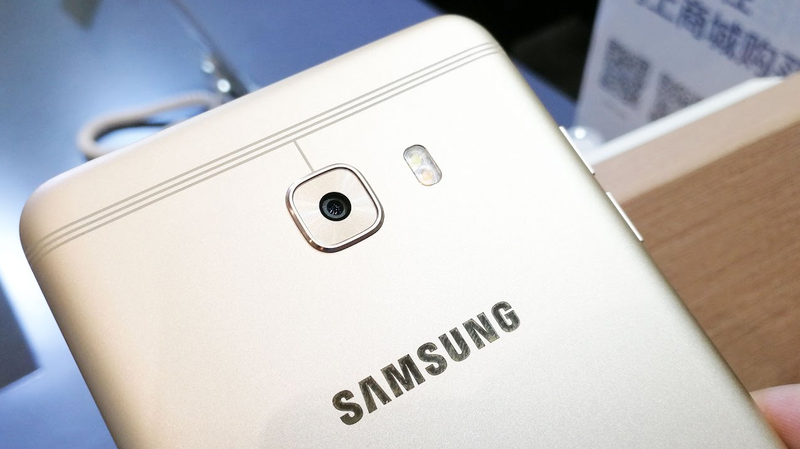 Check out the improvements it brings to the Galaxy Note 5 below and in the screenshot. •	The Security of your device has been improved. 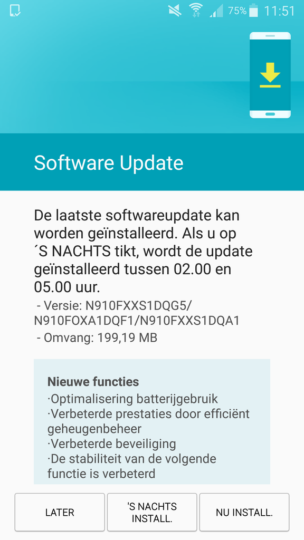 The Galaxy S8+ had started to receive the June Security Patch in Europe a few hours ago and now a new report has confirmed that the same update has also started to land on the Indian variant. It is just a maintenance update but it is quite a significant one for a number of reasons. Firstly, the monthly SMR for June actually addresses 96 vulnerabilities in the base Android OS; which is in itself quite a large hole to fill! Add to that the fact that it also carries a few of Samsung's own updates to the UI and it suddenly begins to seem like quite a significant update. Apparently, the most prominent change which this update brings to the S8+ are new colors for the navigation bar background. Given all that it is carrying, the 453.72MB size is quite understandable. Did you start to receive the update in your location yet? If you did and you don't live in Europe or India, please let us know in the comments. The Galaxy Note 4 may not be getting Android 7.0 Nougat officially from Samsung, but the OEM is still providing regular monthly updates to the Galaxy Note 4 and Galaxy Note Edge. While all other major US carrier variants and the unlocked versions had already received the security patch for June, AT&T wasn't there yet. Fortunately for its users, the carrier has now joined the likes of Verizon and T-Mobile by rolling out the June security patch for the Note 4. The OTA update will come in at an ultraslim 23MB package and if you are using the Note 4 on AT&T, it should be hitting your device anytime now, if it hasn't already. Firmware version of the SMR update is N910AUCS2EQF1. 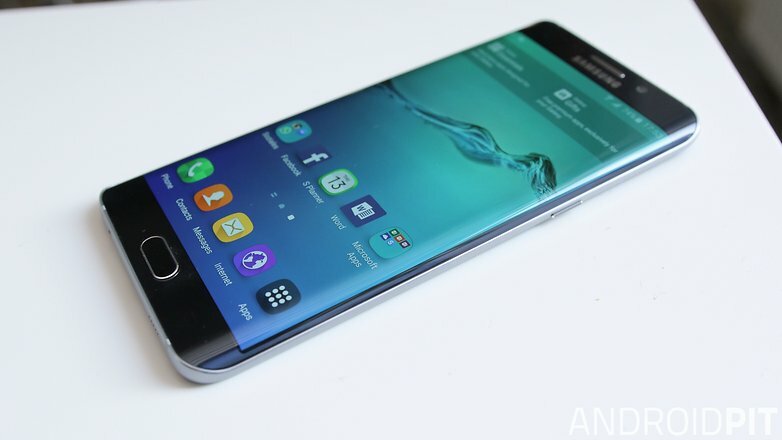 Update: It seems that the same monthly security update is also out for the Galaxy Note Edge. Firmware version for this one is N915AUCS2DQF1 and it comes in at a slightly bigger size of 27MB. 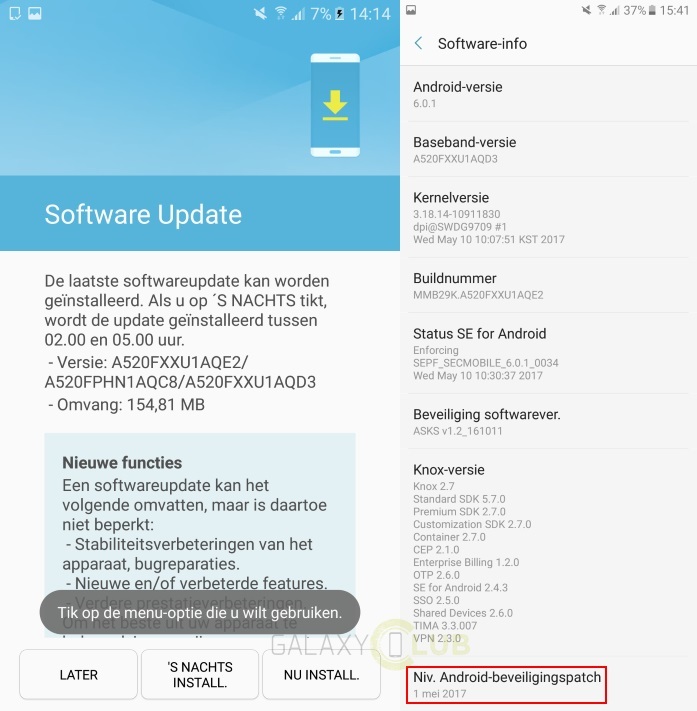 Surprisingly enough, Samsung started rolling out the August security patch to the Galaxy J7 Prime on the first day of August, even before Google but that's a different report which you can read here. 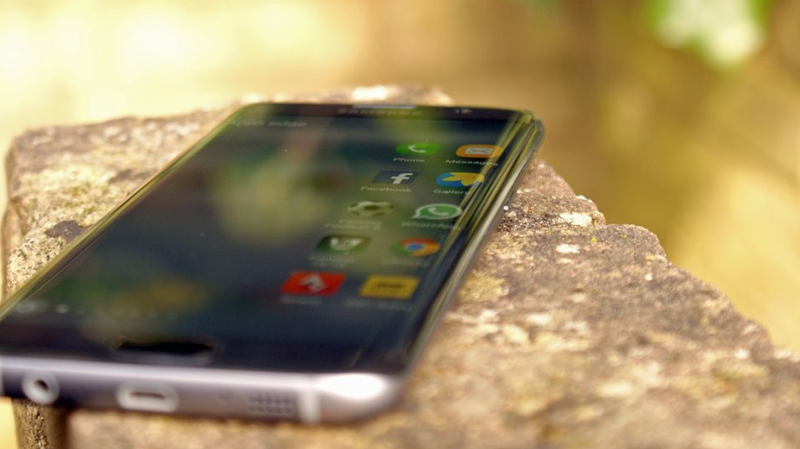 This report here is all about the Galaxy S7 Edge receiving the August security update from Samsung in Mexico, as per a report by SamMobile. If you have news regarding the same update making rounds in other regions as well, do inform us in the comments section. The patch fixes 40 security issues in total for all Samsung smartphones, with 28 of them being from Google and the remaining 12 from Samsung. 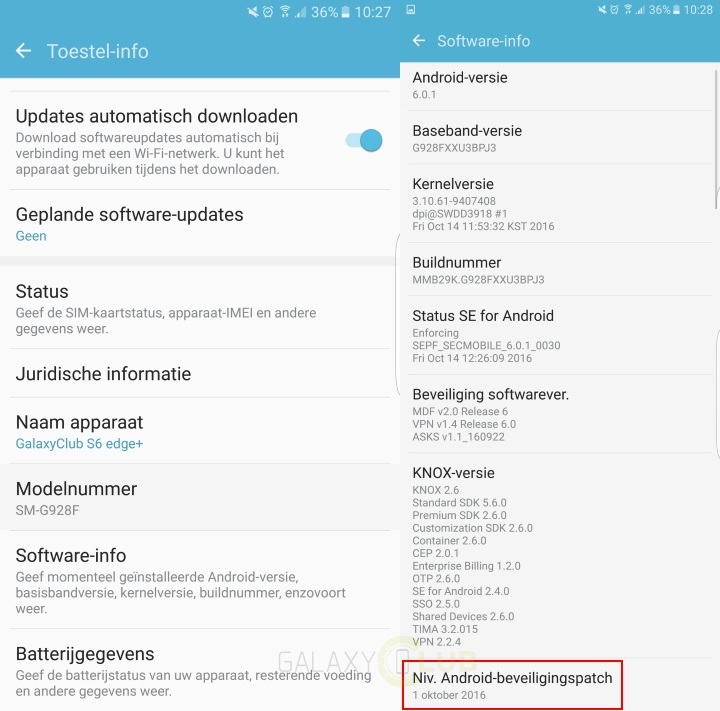 Firmware version on the OTA package is G935FXXU1DQH3 in Mexico, but it will vary slightly, depending on what country you are in and what version of the Galaxy S7 Edge you are using (carrier locked, unlocked, Exynos, Snapdragon etc.). 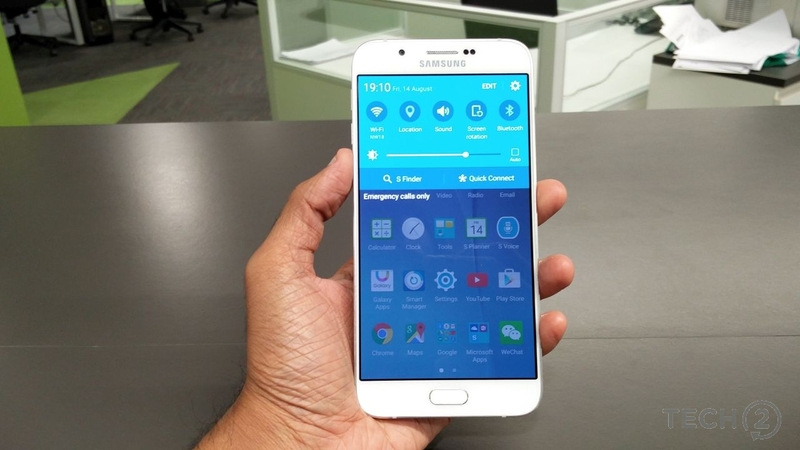 Now that some major handsets are out of the way, Samsung has started rolling out the August security update to the unlocked Galaxy A5 (2016). If you are wondering which regions are getting the security patch at the moment, the good news is that reports suggest all regions more or less are included. So head over to your phone's Settings menu and see if any OTA package is waiting for you in the Software Downloads section. The download is decent sized at 215.08MB so it's best if you hook your phone up with your Wi-Fi first. Firmware version on the update is A510FXXU4CQH2 and it addresses a total of 40 vulnerabilities on the Galaxy A5 (2016); 12 of Samsung's own patches and 28 CVEs common to all smartphones running on the Android OS. This update will also install the Facebook app on your smartphone for some reason! Let us know if you see any major changes in the smartphone's UI after the update. Enjoy! Contrary to every other place in the world, the United States of America is not a good place to buy an unlocked Samsung device if you want fast updates! In the last few years, it has been established that carrier versions will always receive the latest updates before unlocked versions in the country. We are not sure if it's a business decision, but it isn't an unlikely explanation. Nevertheless, the good news is that the unlocked S8 and the S8 + have finally started to receive the latest security patch from the OEM. In case you are wondering, the same patch was already released previously on all major carriers which include AT&T, Verizon, T-Mobile, USC and Virgin Mobile USA. 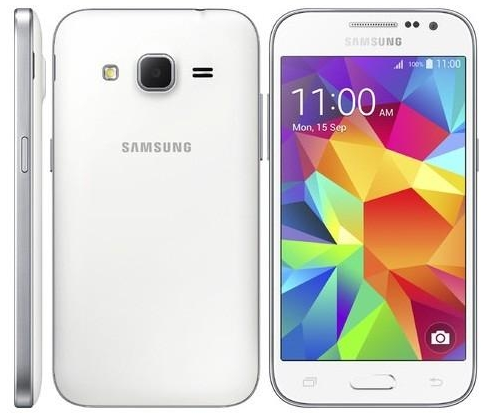 The 600+ MB package will arrive via OTA and the firmware version on it will be G950U1UEU1AQH3. Check to see if it has already arrived from Settings > Software Update. If it isn't there yet, just wait for a few hours and try again. The situation is a bit confusing now because Samsung has likely already provided the necessary patches to take care of the infamous BlueBorne vulnerability, but an app on the Play Store which checks your device to see if it is still vulnerable is clearly showing that the Note 8 is not yet safe. Why is this happening you may ask? The answer is quite simple really! Samsung patched the BlueBorne security gap on their own with the August patch itself, while the BlueBorne Vulnerability Scanner app only marks Android phones with the September patch as "safe." As you can imagine, this should actually be an epic win for Samsung, but as fate would have it, the Note 8 is receiving negative publicity because of it! The truth is that Samsung managed to patch a major flaw in the OS even before Google did it and that deserves some applause! The bottom line is that if you own a Galaxy Note 8, you should rest easy because as far as the software side is concerned, Samsung has you covered for now. Given my recent experience, I am not so sure about the hardware part though! 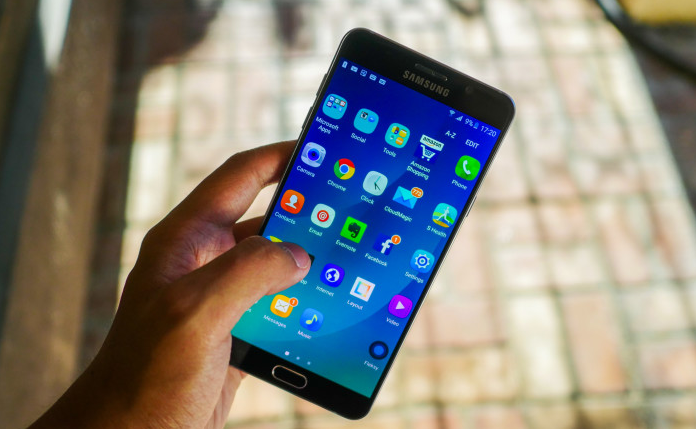 By now, anyone who is even mildly concerned with his/her smartphone's security, knows about the infamous BlueBorne attack and thankfully, Samsung has patched it on all its major handsets. In fact, Samsung had patched it with the August SMR even before Google released the official BlueBorne patch along with the September security update. Unfortunately, it had led many users to falsely believe that the new Note 8 was susceptible to the attack because it didn't have the September security update. 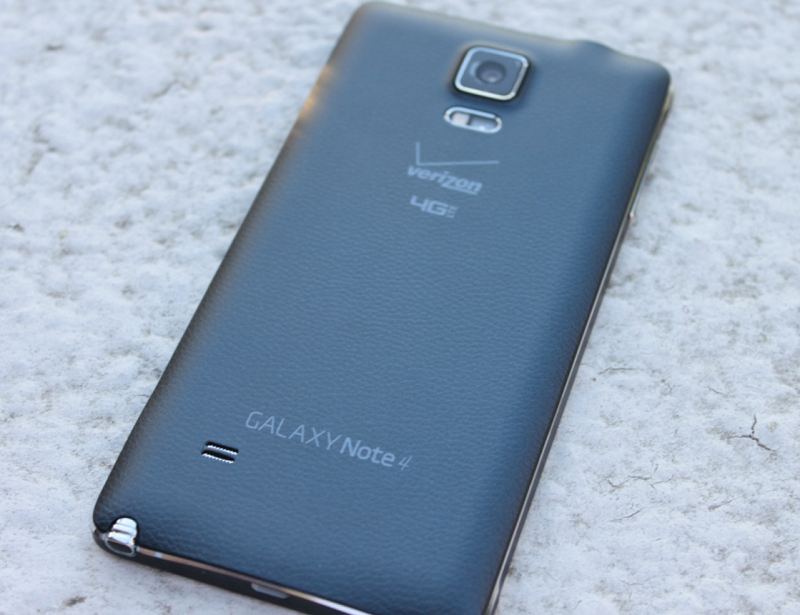 Now Verizon has also released the necessary patch to protect the Galaxy Note 4 against the BlueBorne threat with firmware version N910VVRU2CQI2, which will arrive on the handset via OTA. 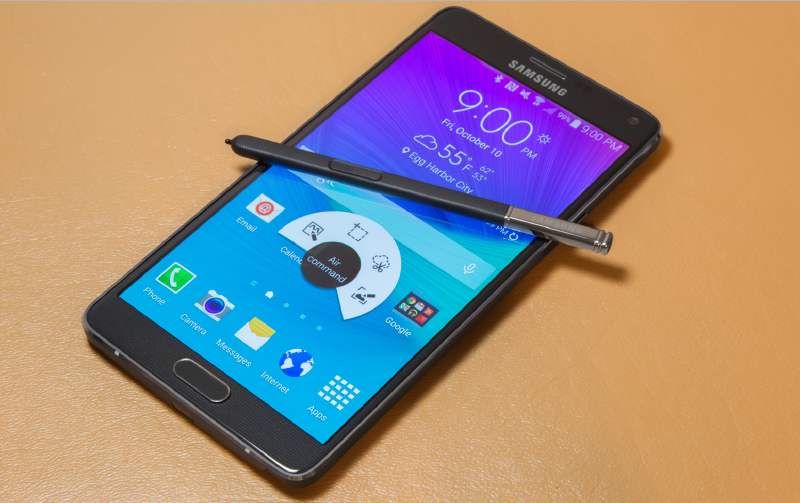 This also contains all other necessary security patches to keep the aging Note 4 safe from external threats. Just in case you are not aware what the BlueBorne threat is, know that it is a Bluetooth based hack which allows hackers to take control of any device with remote code execution via Bluetooth. Once the hacker gains access to the device, they can basically do anything from installing damaging codes to stealing private data stored on the smartphone. Samsung has not been able to roll out the security patch for September yet for some reason, but they have been rolling out the BlueBorne patch for all its devices sincerely. One would think that the S8 and the S8+ would be higher on the priority list, but Samsung rolled out the patch to a lot of other older and less premium handsets first. That is not necessarily a bad thing though and at the end of it all, the good news is that the patches for the S8 and the S8+ are finally here after all. 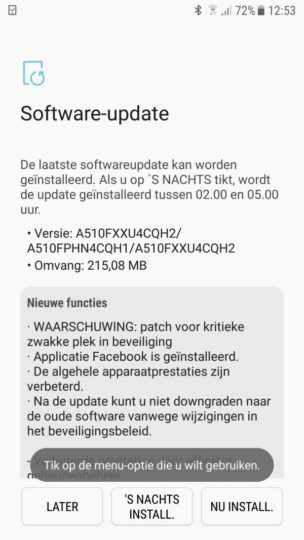 The update is a huge one at almost half a gigabyte (476.63MB) and as of now it's only rolling out in the European region (Netherlands mainly). Alongside patching the infamous BlueBorne bug, it also brings improvements to wireless charging and the navigation bar apparently. 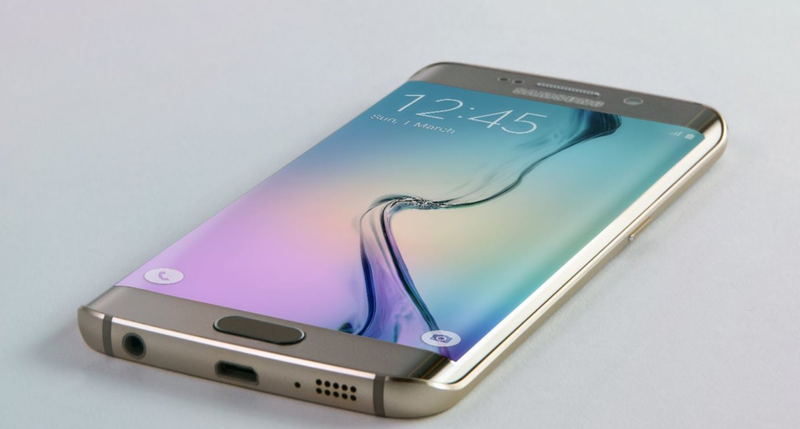 After patching quite a few other models, Samsung has now turned its attention to the flagship handsets from the year 2015; the Galaxy S6 and the Galaxy S6 Edge. If you live in the European region, your S6 or S6 Edge should be prompted for an OTA update soon enough. If you have the regular S6, the build version should be G920FXXU5EQI6, while if you have the S6 Edge, you should see build number G925FXXU5EQI6 making its way onto your smartphone. Just like all the other BlueBorne patches released by Samsung so far, this one doesn't have the September patch from Google either. This essentially means that Samsung has actually skipped the September patch altogether in favor of rolling out the BlueBorne security update. We will now have to wait for the October update to arrive for all Samsung devices. Just in case you are not aware what BlueBorne is, know that it is the latest hack that's threatening security across all the three major platforms; Android, iOS and Windows. All it needs is a Bluetooth connection (not even permission to connect is required) and hackers can access your device and all data in it. Better download the update fast! Sorry for being a bit late to report this one, but it's good news nevertheless. 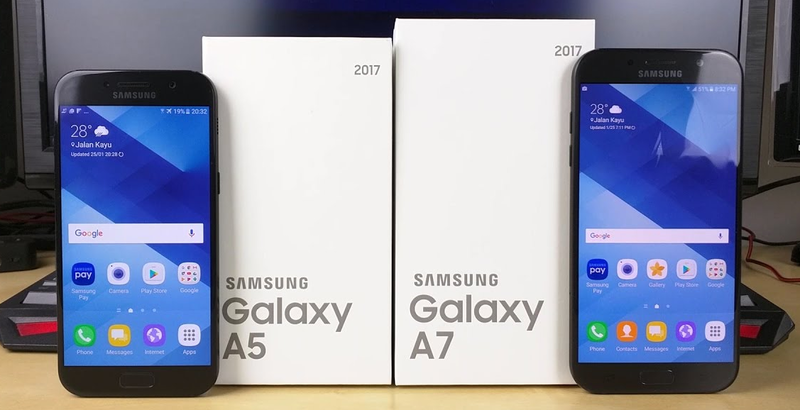 The Galaxy A5 smartphones from both 2016 and 2017 have now started to receive the October security patch from Samsung. It is a bit surprising that Samsung would prefer to release it for its mid rangers before the flagships, but it's good that that the OEM doesn't seem to be discriminating too much in between their handsets when it comes to security. The October security update comes after Samsung decided to skip the September SMR entirely in favor of patching BlueBorne, so it's the first Android security patch from the company after August. This one comes loaded with patches for a whopping 215 vulnerabilities found within the Android OS in general and a meager 6 fixes for Samsung's own UI. By now, I wouldn't be surprised if some other devices have started to receive the same update from Samsung as well, so do let us know if we missed something. 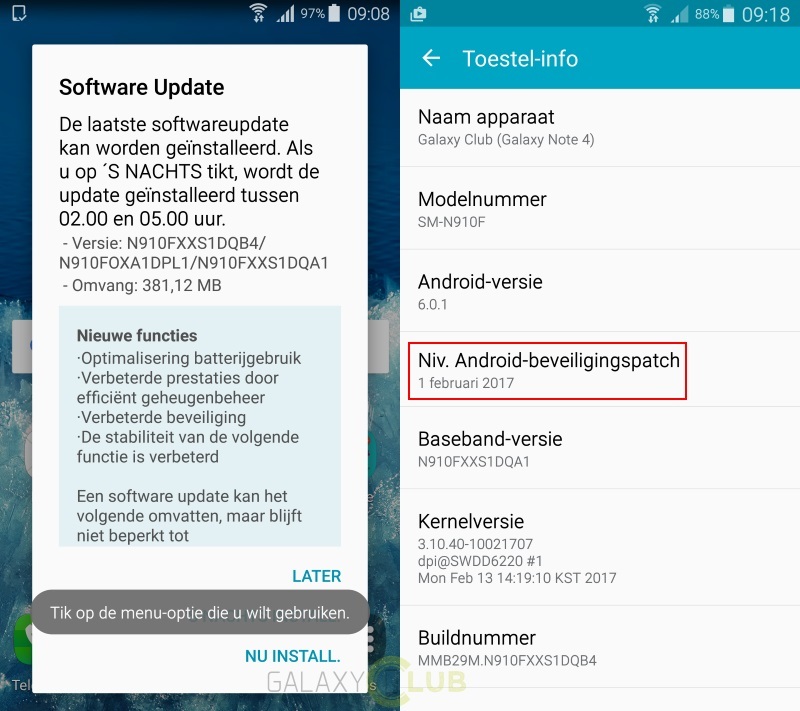 The October patch has now started to hit unlocked Galaxy S7 and S7 Edge handsets across Netherlands and hopefully other regions by the time you are reading this. As Samsung had skipped the September patch this year, this is the first Google security update that Samsung smartphones are getting after August. 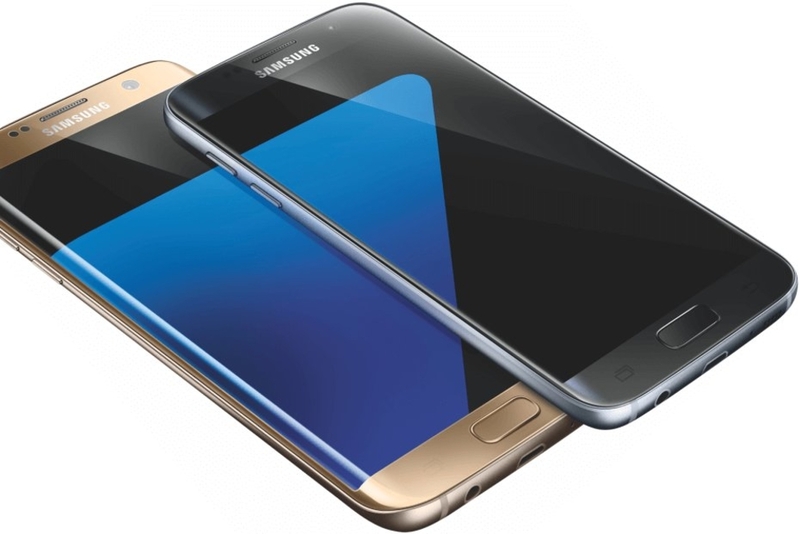 Firmware versions G930FXXU1DQJ1 and G935FXXU1DQJ1 are released for the Galaxy S7 and S7 Edge respectively and you should be prompted to update your device anytime now. The decent sized 122MB packages should contain fixes for 215 vulnerabilities and bugs in the Android OS, as well as Samsung's own six patches for their part in the phone's software. The OEM had to skip the September security update because they were too busy patching the infamous BlueBorne security threat, which was a serious problem last month. 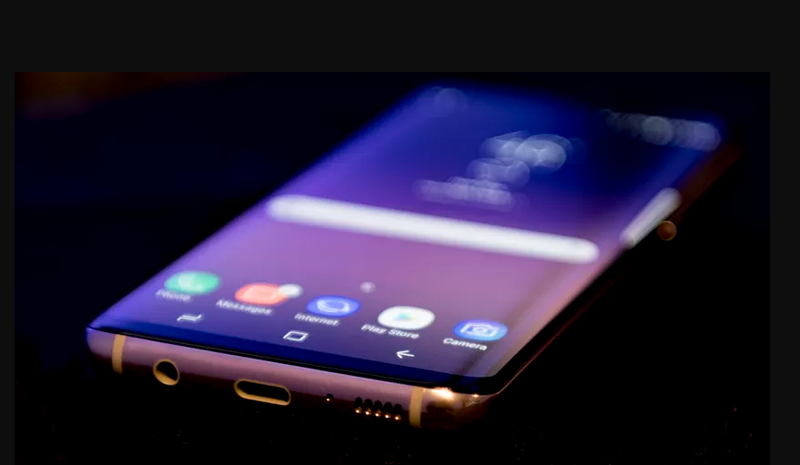 Nevertheless, no reports indicate that any Samsung phone was left unprotected last month, which signifies that although they did not release the September security patch, the BlueBorne patch was more than apt to keep the devices secure for the time being. 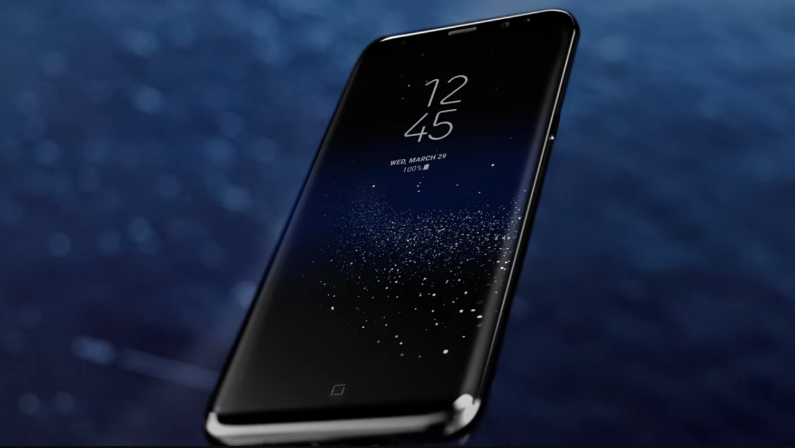 The Galaxy S8 had already started to receive the October security patch over four days ago, but Samsung's latest flagship handset is yet to get the same treatment. The wait for owners of the Note 8 is about to be over though, as reports from multiple sources have confirmed that the month's patch is now reaching Galaxy Note 8 smartphones in China and Hong Kong. 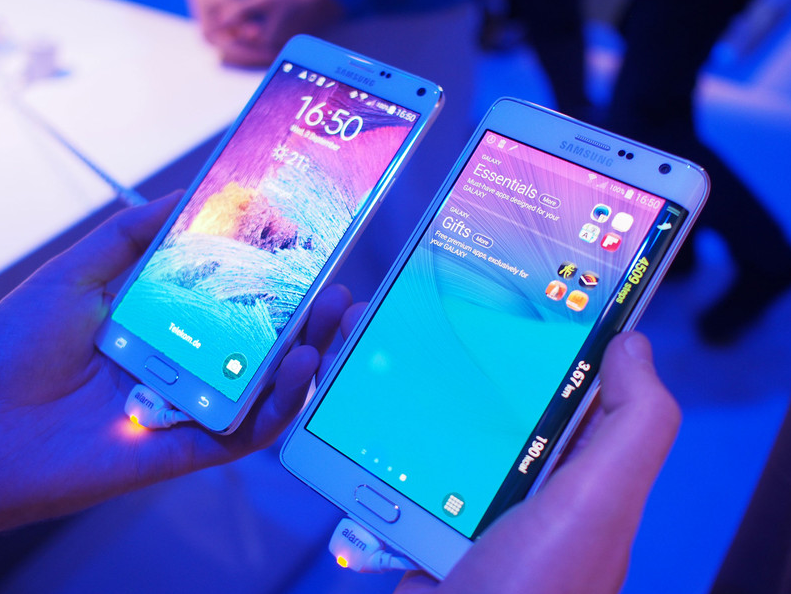 The two models eligible for the update in those regions are the SM-N9508 and SM-N9500. Although Chinese updates are seldom very indicative of the same patch making its way into other countries, it's good to know that Samsung has at least started to roll out the OTA package for the Note 8. We would estimate that the update will soon be released in Europe, given that we have almost reached the end of the month! When it does arrive, 215 vulnerabilities in the underlying Android OS will be addressed, alongside six in Samsung's own overlying UI. Do let us know in the comments, if you see the October patch hitting your device in other regions. Samsung is on a roll now as the OEM keeps sending out the October security update to its handsets from all tiers. 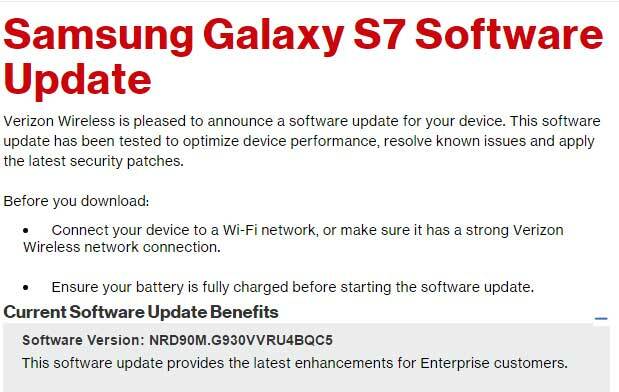 Just yesterday, reports had confirmed that the Galaxy Note 8 was receiving this month's security patch in China and today we have news from SamMobile that the Galaxy S6 Edge is now getting the same OTA package, albeit in the form of a different firmware! 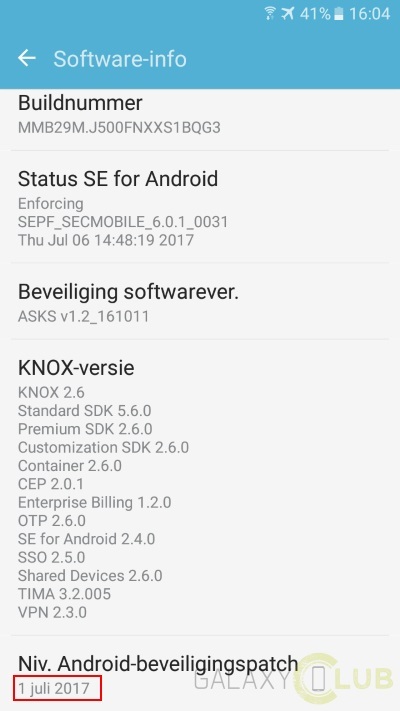 Speaking of firmware, version G925FXXU5EQI8 is making its way onto Galaxy S6 Edge handsets across UK, as you read this. The October patch should make its way into the US and other regions very soon as well, but if you live in Europe, chances are that your handset is going to be the first on the line. On a general note, this is going to be Samsung's first monthly security update after August and it's going to fix about 215 CVEs and 6 kinks in Samsung's own user interface. If you own the Galaxy J3 (2017) and you live in the US, we have good news for you. 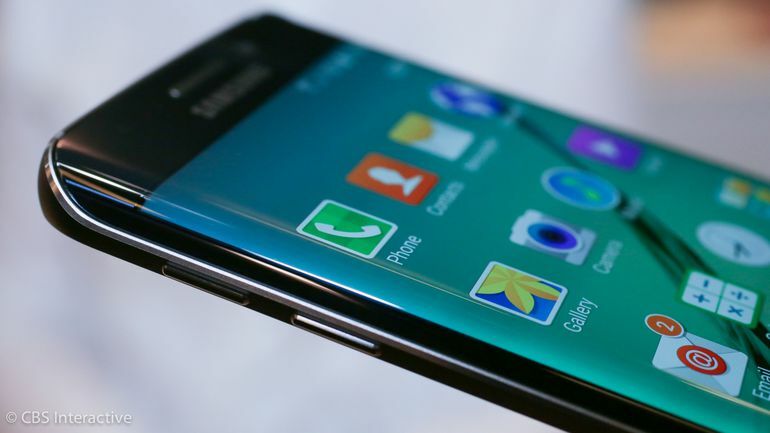 Although it's already November, Samsung has finally managed to release the October security patch for the handset. As long as you own the model SM-J327U, you should be seeing the update arrive anytime now. 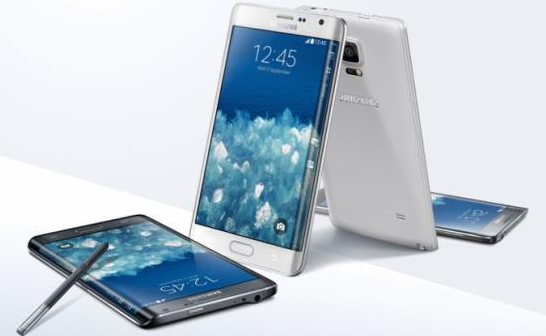 Firmware version J327UUEU1AQJ1 will patch about 215 common vulnerabilities and bugs in the base Android OS, in addition to the six that's common to only Samsung handsets. In case you are wondering why you did not receive the September patch, know that no Samsung handset did! The OEM was too busy patching up the infamous BlueBorne threat on all its models to release the September patch. As to why the October patch arrived this late, that's just how Samsung works; they were never known for delivering timely updates every month in the first place!